Vanport, sometimes referred to as Vanport City or Kaiserville, was a hastily constructed city of wartime public housing located in Multnomah County, Oregon, United States, between the contemporary Portland city boundary and the Columbia River. It is currently the site of Delta Park and the Portland International Raceway. 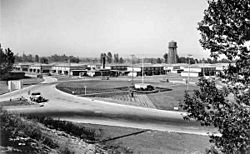 Vanport construction began in August 1942 to house the workers at the wartime Kaiser Shipyards in Portland and Vancouver, Washington. Vanport - a portmanteau of 'Vancouver' and 'Portland' - was home to 40,000 people, about 40 percent of them African-American, making it Oregon's second-largest city at the time, and the largest public housing project in the nation. After the war, Vanport lost more than half of its population, dropping to 18,500, as many wartime workers left the area. However, there was also an influx of returning World War II veterans. In order to attract veterans and their families, the Housing Authority of Portland (HAP) opened the Vanport Extension Center (Vanport College). The college enrolled 1,924 students its first year. 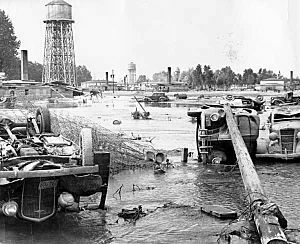 Vanport was dramatically destroyed at 4:05 p.m. on May 30, 1948, when a 200-foot (61 m) section of the dike holding back the Columbia River collapsed during a flood, killing 15. The city was underwater by nightfall leaving its inhabitants homeless. The Vanport Flood parallels the more recent Hurricane Katrina disaster in New Orleans. In both cases, public officials led the population to believe that the damage would be slight, and in both cases the government response to the disaster was harshly criticized. Critics attributed the poor response, in both cases, to racist attitudes on the part of officials, who allegedly neglected to respond appropriately to the destruction of predominately black communities. 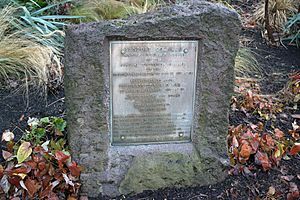 However, many dispute the role of racism, pointing to the transformation of Vanport by the influx of World War II veterans and their families and official commitment to the area shown by the establishment at Vanport of the only state college in the greater Portland metropolitan area. As a hub of transient laborers from all corners of the country, few residents had any long-term connections with each other and little opportunity or interest to build them. The temporary nature of the new city contributed to an overall sense of insecurity and anxiety among residents. The lack of businesses and recreation opportunities contributed to a sense of distrust, and the relative isolation of the largely male workforce meant there was little demand for community institutions such as a newspaper or high school. By 1943–44, families living in Vanport were moving out at the rate of 100 a day. A questionnaire mailed to 1,000 former Vanport families, selected randomly from the approximately 3,000 families who had left by then, asked, among other things, why they had moved to Vanport in the first place. About 230 people answered this question. The top reason given for choosing the Portland–Vancouver shipyards was that "they thought it their duty to go into defense work". The second-ranked reason was a desire for a better job, and the third, higher wages. However, the situation changed when the war ended in 1945. HAP then sought to attract World War II veterans who needed housing, a community to raise their families, and higher education through the Servicemen's Readjustment Act (G.I. Bill). The establishment of a college at Vanport in 1946 was a key part of the strategy to keep Vanport a thriving Oregon community. The establishment of Vanport coincided with an unprecedented influx of African-Americans into Oregon. The state had a population of fewer than 1,800 blacks in 1940; by 1946 more than 15,000 lived in the Portland area, mostly in Vanport and other segregated housing districts. (In the 1920s, Oregon had been one of the strongest Ku Klux Klan states in the Western United States.) One prewar observer, Portland Urban League secretary Edwin C. Berry, described Portland as a " 'northern' city with a 'southern' exposure", arguing that the city shared with southern cities "traditions, attitudes, and things interracial in character." Berry argued that prior to the war the city exhibited remarkably unprogressive racial attitudes. The hastily constructed wartime development’s social and cultural mores had little in common with Portland as a whole. Vanport’s in-migrants imported their particular brands of racism from throughout the country. White migrants from the South were the most vocal in opposing the degree of integration that HAP dictated for schools, buses and work sites. The Authority was largely unsympathetic to these complaints and at no time was de jure segregation imposed on any of Vanport's facilities. When police were called because black men were dancing with white women at a local event, only the white women were detained and warned that their conduct might lead to a race riot. HAP never had any explicit policy advocating segregation; nonetheless, for various reasons de facto segregation was the norm. Whites complained when placed near “black” areas, and segregation of Vanport by neighborhood might as well have been enforced legally. Only in 1944 were complaints raised about the segregation situation in the city. Reacting to the criticism—and pressure from Eleanor Roosevelt—by April 1944, HAP began placing incoming blacks into the “white” areas of the settlement. However, word quickly spread and 63 white residents quickly signed a petition demanding a reversal of the policy. Entire buildings were free in the “black” areas of town, they argued, and after opponents of the integration plan appeared at a HAP meeting the authority decided to resume its previous policies. The unprecedented level of integration and lack of any major racial incidents or severe tensions did not mean there were no problems. Black/white tensions were still a part of Vanport life as well as a problem in relating to Portland. A 1943–44 study published in the American Sociological Review indicates that the top five complaints from Vanport residents included "negroes and whites in same neighborhood", "negroes and whites in same school", and "discrimination against Vanport people by Portlanders". Although some of Portland's blacks lived in 53 of the city's 60 census tracts before the war, about half were concentrated in two tracts east of the Willamette River and north of the east–west centerline of the city. After the war, much of Portland's black community remained centered in northeastern parts of the city. Vanport was especially vulnerable to flooding, since it was built on reclaimed lowlands along the Columbia River. The Columbia Basin is a massive area encompassing seven U.S. states and British Columbia, Canada. The previous winter snowpack was 75 to 135% of normal. Above normal temperatures accompanied two major rainstorms May 19 to 23, 1948, and again May 26 to 29. Rainfall combined with melt water swelled the many tributaries feeding the Columbia in the days prior to the flood, creating high water levels not seen since the record flood of 1894. The lowest point in Vanport was about 15 feet (4.6 m) below the water level in the river. A radio alert was issued the night before the flood, and some residents moved their belongings into attics and upper floors. Few imagined the possible extent to which the water levels would rise. Another contributing factor to the lack of voluntary evacuation was the fact that many residents relied solely on public transportation. On the morning of Memorial Day, May 30, 1948, the Housing Authority of Portland issued the following statement: "Remember: Dikes are safe at present. You will be warned if necessary. You will have time to leave. Don't get excited." At about 4:17 p.m. the Spokane, Portland and Seattle Railway berm burst, sending a 10-foot (3 m) wall of water into the area of Vanport College. Because of the numerous sloughs and backwaters in the area, the progress of the flood was delayed about 30 minutes, giving residents more time to escape. An emergency siren began to sound shortly after the initial breach, and residents began to head up North Denver Avenue to higher ground. 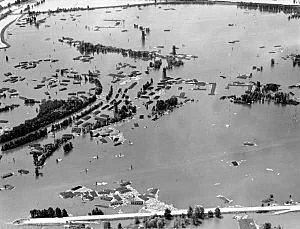 At the time of the flood, the population of Vanport was down to about 18,500 people. Because of the holiday, many residents were away from their homes for the day. These factors contributed to the low loss of life: there were only 15 deaths. Nonetheless, the city was a complete loss. On June 11, 1948, President Harry S. Truman flew to Portland to examine the damage. The recovery effort was assisted by Vanport College and the Red Cross. Vanport led Portland and Oregon in integrating blacks. "The first black teachers and policemen in the state were hired in Vanport during the war years". One of those black teachers, Martha Jordan, later became the first black teacher hired by Portland Public Schools. Vanport's destruction eased the integration of a large African-American population into North and Northeast Portland. Indeed, some black leaders argued that the flood was ultimately beneficial for the city's black community. Vanport, argued National Urban League director Lester Granger, was a “nasty, segregated ghetto” where “negroes lived in the same patterns as they did in the South.” The flood that wiped out the district, he continued, was a benefit in that it allowed blacks to further integrate into Portland's society. To prevent future incidents, Congress enacted the Flood Control Act of 1950 which spawned projects such as the Priest Rapids Dam. The flood also resulted in the 1961 Columbia River Treaty and later the construction of Libby Dam in Montana. The loss of Vanport is considered a factor in the eventual closing of the Jantzen Beach Amusement Park on Hayden Island. Several acres of the former city became "West Delta Park" which is now the Portland International Raceway. The Vanport Extension Center refused to close after the flood disaster and quickly reopened in downtown Portland. Dubbed by a national magazine "The College that Wouldn't Die," it became present-day Portland State University. Vanport, Oregon Facts for Kids. Kiddle Encyclopedia.